The RSI-S1 sink is a great sink that allows within minutes a fully function sink to be installed outdoors, all that is needed is a standard garden hose. With the Riverstone outdoors sink you can keep the dirt out of the house. Whether using it to clean dirt off shoes or boots, garden tools, paint brushes, kids hands, cleaning vegetables and herbs from your garden, or just about anything you need to clean the Riverstone Sink works great. The smaller outdoor sink can hold up to 100 ft of hose on the built in hose reel and can easily be detached from the wall with a simple upward motion. Features: Outdoor garden sink/watering station. Comes with mounting hardware, drain tube, and nozzle holder. Great for washing hands. Quick set-up. Soap area built in. Drainage hose included. Holds up to 100 ft of garden hose. Makes washing fruit or vegetables outside easy. Made from durable plastic. Hose and nozzle sold separately. Holds up to 100 ft of garden hose. Hose and nozzle sold separately. Great for washing hands. Makes washing fruit or vegetables outside easy. Broil Chef's Built-In LP Gas Grill comes with five high powered, cast stainless steel burners that produce 75,000 BTUs, combined with a ceramic rear rotisserie burner pushing out 12,000 BTUs for a total of 87,000 BTUs of grilling power. This 40-inch grill features a warming rack, halogen lights mounted on the interior canopy, and a heavy-duty thermometer to help you cook food perfectly every time. Protect your NewAge Products Outdoor Kitchen Cabinets with our premium all season Polyester Covers. Made with high UV-rated woven polyester for optimal protection from the elements, and designed with reinforced corners for long-lasting durability. Finished in a sleek slate gray colour, these all season covers are the perfect accent to most landscapes. Riverstone Outdoor Sink The RSI-S1 sink is a great sink that allows within minutes a fully function sink to be installed outdoors, all that is needed is a standard garden hose. With the Riverstone outdoors sink you can keep the dirt out of the house. Whether using it to clean dirt off shoes or boots, garden tools, paint brushes, kids hands, cleaning vegetables and herbs from your garden, or just about anything you need to clean the Riverstone Sink works great. 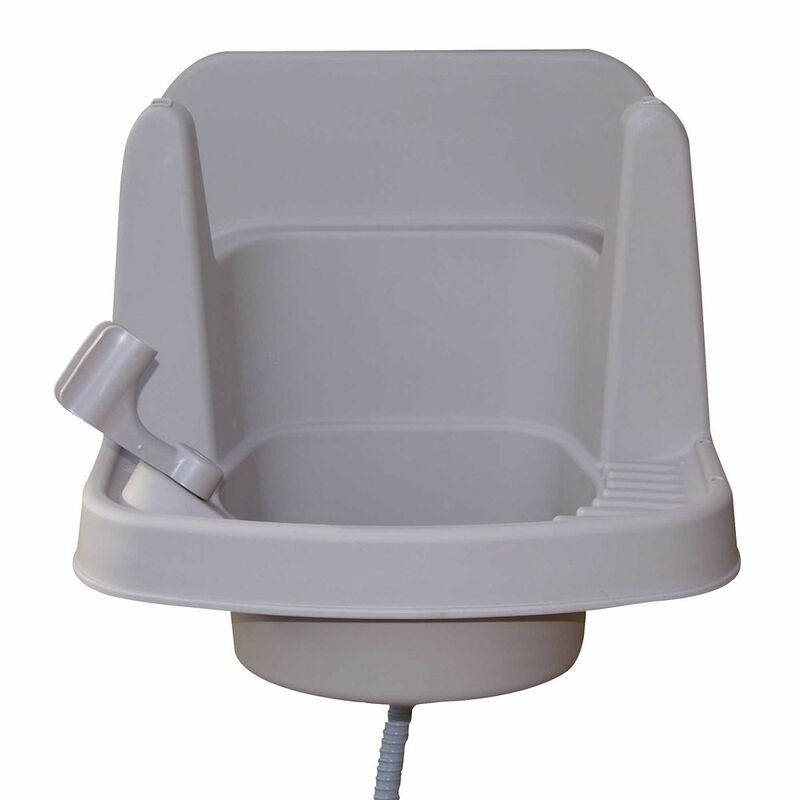 The smaller outdoor sink can hold up to 100 ft of hose on the built in hose reel and can easily be detached from the wall with a simple upward motion. Features: Outdoor garden sink/watering station. Comes with mounting hardware, drain tube, and nozzle holder. Great for washing hands. Quick set-up. Soap area built in. Drainage hose included. Holds up to 100 ft of garden hose. Makes washing fruit or vegetables outside easy. Made from durable plastic. Hose and nozzle sold separately. Riverstone Outdoor Sink is rated 4.3 out of 5 by 4. Rated 3 out of 5 by VJL2589 from Not The best puchase I've made Product does the job but is not worth the $50.00 price, vey cheaply made. Rated 5 out of 5 by Keith from Excellent addition to my pool-side tiki bar. Mounted it on the pool deck hand rail behind my tiki bar, could've used a template for pre-drilling the screw holes. Installed an outdoor faucet to the existing hole on the side of the sink, connected a potable water hose, and now I have a sink with running water to rinse glasses and shakers.